The Olympic Games bring together athletes from all over the world in celebration of national pride and global community. Perhaps your own child harbors visions of one day becoming an Olympic athlete. 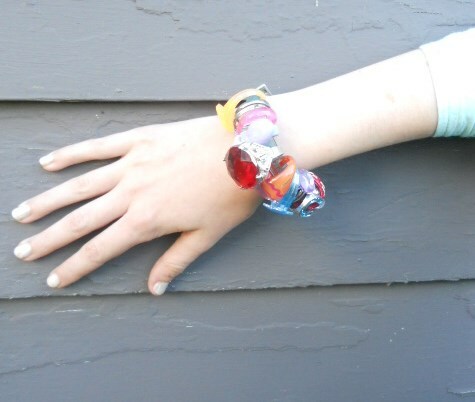 But whether your child is an Olympic hopeful or simply an avid fan, she can show her pride and support of the Games this year by making Olympic ring bracelets. Wear them throughout the Games to cheer on your favorite athletes! Did you know?The five colors of the Olympic rings symbolise the five continents: the Americas (North and South), Asia, Europe, Africa, and Australia. Help your child choose a colour to start with, then measure and cut two 3' lengths and one 1 1/2' length of string in her chosen colour. Have her carefully knot the three strings together about an inch or so down from the top. Place the knotted strings on a table or other hard, flat surface with the shorter string in the middle between the two longer strings. Tape the strings to the table, placing the tape above the knot. Tape the shorter piece of string to the table about 5 inches below the knot. Taping the strings down makes braiding easier, and you can move the tape down when you need more room. Now it's time to braid. Drape the long piece of string on the left (string A) over the other two strings so it points to the right. Thread the right-hand string (string B) up and over string A, under the centre string, then through the left-hand loop created by string A. String A should now be pointing right and string B should be pointing left with a loose, pretzel-like knot over the centre. Gently pull on both ends of string at the same time to tighten the knot. As you do so, the knot will move up to the top and rest just under the top knot you created in step 1. String A will now be on the right and string B on the left. To create the second knot, repeat step 4 but begin on the right side rather than the left, as string A is now on the right. For each knot, you always begin with string A. It might be useful to make a small knot or place a safety pin on the end of string A to help your child remember which side to begin with. Once your child understands the braiding process, let her take over. Have her continue braiding until the length of knots is long enough to fit around her wrist. When the bracelet is long enough, make a knot at the bottom of the bracelet to secure the three strings together. Tie the bracelet around her wrist and trim any loose ends. First one down, four to go! 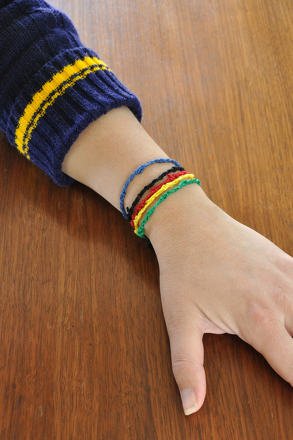 Make one bracelet in each of the colors of the Olympic rings. 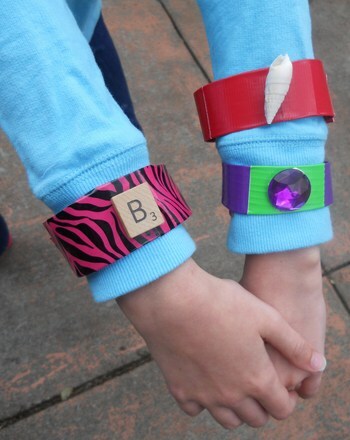 Your child can wear her bracelets stacked on one wrist, or arranged on both wrists. Sport them during the Opening Ceremony to show off that Olympic pride! He'll even get to cut out his own Olympic rings. Aim for reading success with this worksheet about the Olympic version of archery. Get straight to the point with this worksheet about fencing, one of the lesser-known Olympic sports. Learn more about the Olympic sport of cycling with this worksheet that contains reading comprehension and fun puzzles. Learn about "Citius-Altius-Fortius" with this printable about Olympic symbols. The torch is one of the hallmark symbols of the Olympic games. But what exactly does it stand for? 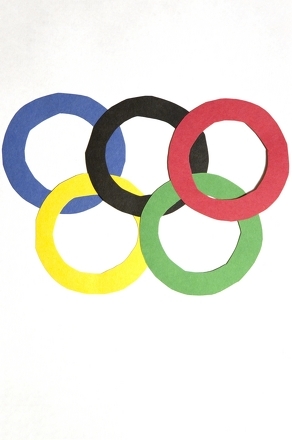 Get a lesson in symbolism with this Olympics worksheet. Develop graphing skills with this Summer Olympic medals graphing worksheet. Hand her this worksheet about some Olympic events: canoeing and kayaking.